If you want something a little more in depth, I have a full-review over on Must Contain Minis, but here I am going to discuss what excites me the most about the system. What excites me most is the campaign system. The game itself is very simple and quick to play. If you don’t like simple, you might want to carry on with something else. That said, this is the type of game that will come into its own as you play a series of games through the campaign system. In the interest of full disclosure, Osprey Games sent me a review copy of Last Days: Zombie Apocalypse. The setting is pretty simple. Zombies have taken over and you are just trying to survive. Resources are scarce and other groups are after the same items as you. Here you fight for survival and do your best to avoid death at the hands of a zombie. 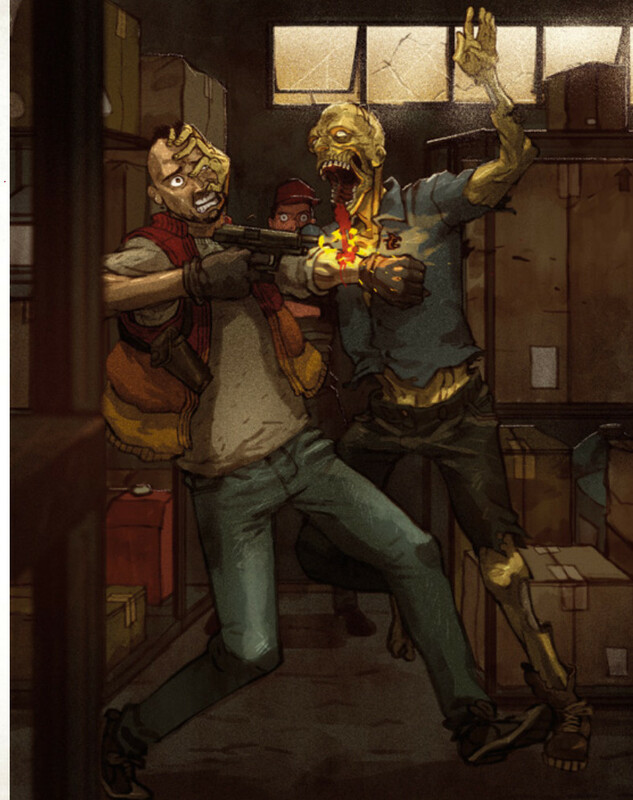 A survivor almost meets his fate at the hands of a Zombie. Art used with permission from Osprey Games. Your group will consist of a Leader and likely 5 to 7 other characters. These people all rely on each other to survive in this harsh new environment. There are three leader types and 15 character types to choose from. Which character you select determines how many characters of various types (keywords) you can take in your group. No cops or good Samaritans will want to work for a selfish leader. 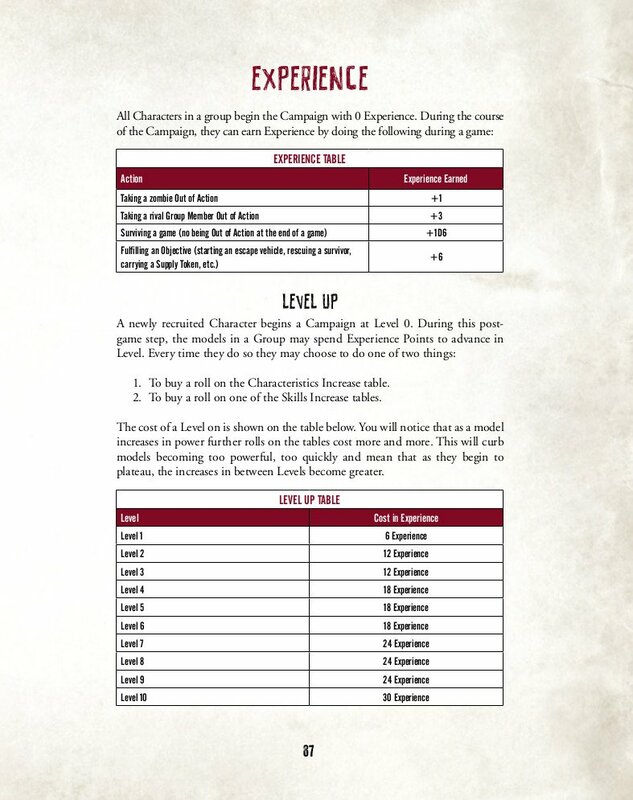 During the game, everyone in your group gains experience and levels up. Below is a sample page from the book showing the experience table. The Experience Table from Last Days. Image used with permission from Osprey Games. As you level up, your characters gain more abilities or better stats. Your character type will help determine how they improve, but there is a lot of randomness to it too. Like Frostgrave, Badgers & Burrows and other games, players get to build a base for their survivors. The base determines how many people the leader may hire, has empty slots for upgrades and comes with an upgrade or two built right into the facility. 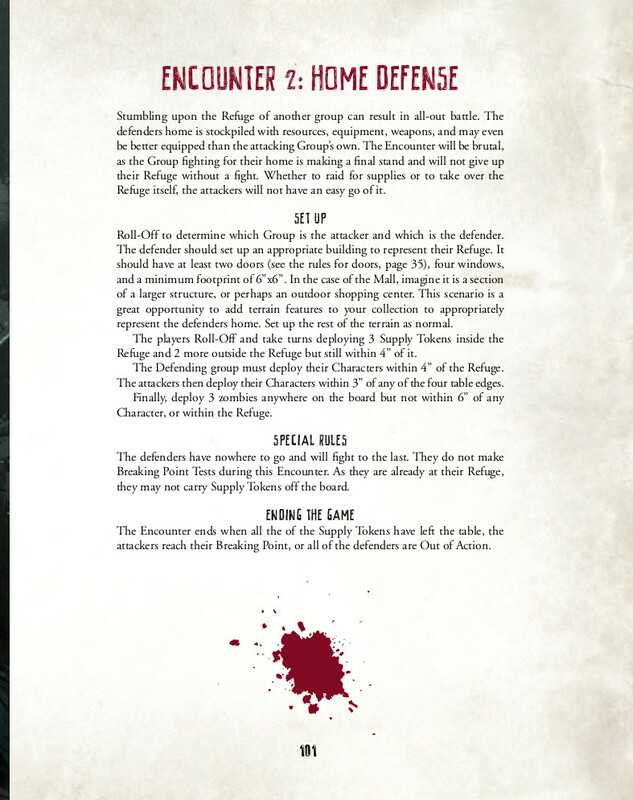 Below is a page from the book that talks about some of the upgrades that players can build into their forts (refuges). 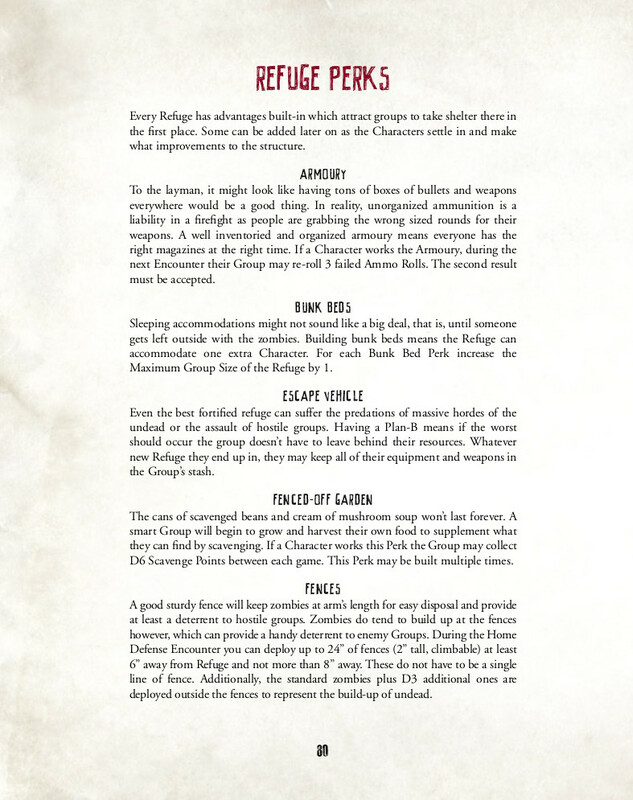 Above is a sample page showing some of the refuge upgrades players can take for their base of operations. Image used with permission from Osprey Games. Even cooler is that the Refuge (and its upgrades) can appear in one of the missions. Check this out!!! In this mission, one player attacks another’s base of operations (refuge). How cool is that?! Image used with permission from Osprey Games. Miniatures-wise, there is a lot available out there that would fit the game. Perhaps you own Zombicide or similar board game, that would do. Maybe you have some other suitable miniatures by other companies. If you do, this is an easy game to get into at a very affordable price. The hard-covered book itself is only $30. For me, it is the campaign system that gets me excited. I am really looking forward to getting this to the table. If you want to know more about the system including its mechanics and my pros and cons lists, check out the full review on Must Contain Minis. 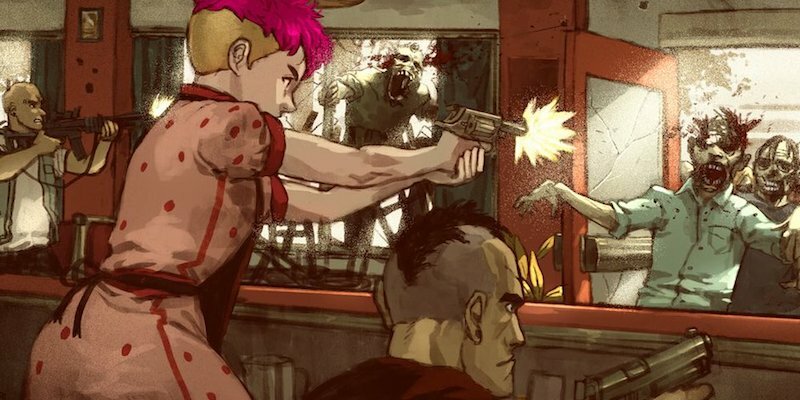 Disclosure: Osprey Games sent me a copy of Last Days: Zombie Apocalypse for Review Purposes. If you are interested and live in driving distance to Chatham, Ontario, KEGSCon 6 is September 28 to 29. For my American friends, Chatham is about an hour away from the Detroit / Windsor Boarder.